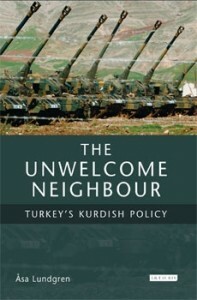 The Unwelcome Neighbour | Roj Bash ! The Unwelcome Neighbour: Turkey’s Kurdish PolicyThe work on this book began within the framework of `Borders, boundaries and transgressions’, a multi-disciplinary research project sponsored by the Swedish Research Council’s programme on West and Central Asia. In this project Inga Brandell, Emma Jorum, Roberta Micallef, Annika Rabo and Tetz Rooke became not only my colleagues but also my friends. During the years I have benefited greatly from the discussions we have had and I am grateful to all of them for having shared their ideas with me.Inga Brandell, Annika Rabo and Bo Utas have given moral and practical support throughout the work on this book. They have also read earlier versions of the manuscript and I am extremely grateful to them for their comments, advice and criticism. I am also indebted to Safeen Dizayee, Özden Zeynep Oktav and Elizabeth Picard who have read parts of the manuscript and given very valuable input. Two anonymous readers at I.B.Tauris have also given important comments.